The cinema is art, it is industry, and it is also technology. One of the simple joys of film studies for me is the amount of time you can spend just focusing on this last aspect, reading through technical descriptions and patents so you can work out how things are done. Film students seem to me to have too little understanding of the technical and technological side of the cinema – they understand style as technique (which it is), but too often do not understand it in relation to the technology employed. This may be due to the fact that most film studies lecturers also have a very limited understanding of how motion picture technology came into being or how it works. This is a shame, because there are some fantastic web resources that could be used for teaching film studies. For example, the teaching of digital cinema needs to address technological issues (not least because they impact on the theory and practice of film studies), bit this need to go beyond simply distinguishing between an analogue image and a digital image, so that students can understand how a digital image is produced – the best explanation for this that I have come across is at Nikon’s Microscopy U website, which is obviously not aimed at film studies students but which has brilliant explanation with great diagrams and animations of how the parallel and serial registers of how a CCD chip functions. There is also a wealth of historical material available, that is simply fascinating to read and provides a great deal of information on the technological history of the cinema. The Internet Archive has the full text of Monthly Abstract Bulletin from Kodak Research Laboratories for 1917 to 1919, which contains a huge amount of information on magazine and journal articles on photography, cinema, and other visual entertainments; and it provides abstracts for patents covering every possible topic for motion pictures.The patents are international and covers the US, the UK, France, Italy, and Germany. (The Bulletin also covers many other areas, and so you will also find references to articles on ‘The Sodium Nitrate Industry in Chile’). A Process of Color Photography. Two negative images are made, one taken through a green filter and one through a red filter. One of these is printed upon positive material and toned to a color complementary to that of the screen through which the corresponding negative was taken. Next the other negative is printed on the positive material in registry with the toned image thereon and the st cond positive image is dyed a color complementary to that of the screen through which its negative was taken. The patentee states that the method may be used either where the two positive images are upon the same side of the positive film stock or where they are formed ujfcn opposite sides. The second negative is printed over the first positive image on the previously exposed positive emulsion without first developing and resensiti/Jng. An Apparatus for Preparing Ck)mbined Motion Picture and Phonograph Records, so as to produce absolute synchronism. Motion pictures and a phonographic record are taken simultaneously of a scene in the usual way. The motion picture positive is then run through the present apparatus and a phonographic record is made in fhe edge thereof from the original phonographic record. As the original phonographic record is turned it oscillates a needle which actuates a lever carrying a heated platinum wire which bears against the moving picture strip so that for every wave in the original phonographic record a corresponding wave will be burned or melted into the edge of the motion picture strip. Synchronizing Photographs and Cinematographs. In recording a play or an opera, the pictures are first taken by means of a cinematograph camera, and the words or other sounds are subsequently recorded by the actors speaking into a phono- graph horn whilst watching their own movements as portrayed on the picture screen ; and during the recording of the sounds, or during a combined reproduction, the speed of the photograph is adjusted into synchronism by the operator watching a tape which bears a series of marks corresponding to marks on the picture film. Another interesting site is Phonozoic, from Patrick Feaster. As the name suggests, this website is devoted mainly to early sound technologies, but it does have some information on patents that relate to motion pictures and sound technology. The index to patents is extensive, but if you scroll down to class 352: Optics: Motion Pictures, you will find references to patents relevant to film studies. Unfortunately the Canadian International Patent Office does not make images for patents from before 1920 available, but you can still find information about who patented what. 259,341. Cubitt, A. S. Aug. 7, 1925. Stercoscope systems; relief effects in kinematograph images, producing. -In order to obtain an effect of relief in a photograph, a camera having a lens of large aperture is used, and a diaphragm having a small aperture is moved either across the lens from one side to the other, or in a circular path round the centre of the lens. In the production of kinematograph pictures, the moving diaphragm is geared with a shutter so that alternate pictures are taken when the diaphragm is moving on opposite sides of the centre of the lens. In the form shown in Fig. 11 for still photography, a diaphragm 5 having an aperture 2 is geared at 6, 7 with a rotary shutter 4 having an exposure opening 3, so that, on release of the shutter trigger 10, the aperture 2 passes approximately horizontally across the lens 1 when this is uncovered by the exposure opening. ; This form may be modified for kinematography by arranging the gearing between the diaphragm and the shutter so that during alternate exposures the aperture 2 moves respectively over the right and left halves of the lens 1. In the form shown in Fig. 13 for kinematography, the shutter 4 carries a pinion 7 gearing with teeth on the periphery of the diaphragm 6 so that the aperture 2 therein describes a circular path round the centre of the lens 1 as the shutter rotates. At each exposure the aperture 2 describes an angle of 45 about the centre of the lens, alternate exposures being made on opposite sides thereof. A modification is also described for still photography in which the diaphragm aperture describes a complete circle round the centre of the lens during exposure. The pdf of this patent can be accessed here. Abstract of GB279220 279,220. Thornton, J. E. Sept. 11, 1926. Kinematograph apparatus.-A film strip, either sensitive or carrying a kinematographic or other series of pictures, is connected permanently or detachably to blank leader strips which are permanently attached to two spools and are formed so as to render the feed mechanism of the projector &c. inoperative upon them; the film may be single-width or multi-width with two or more rows of pictures, first pictures of all the rows being at the same end of the film, and the picture heads being all similarly placed. Single-width films may have marginal perforations or perforations between the pictures, and multi-width films A may have perforations p in the outer margins, and, additionally or alternatively, between the rows of pictures, as shown in Fig. 5, or centrally between the pictures in the rows, as shown in Fig. 7. 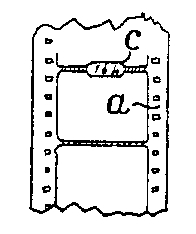 The perforations may be of round, square, diamond, or oblong shape, and are formed only in the film, or extend only a short distance into the leader strips D. being then discontinued, or replaced by slots p’ or cut-away portions of the strips, to render the feed mechanism inoperative. The leader strips may consist of mercerized cotton, linen, artificial silk, parchmentized paper &c., and may comprise two thicknesses of material cemented together, or a textile strip cemented between two paper strips. The strips may be rendered lightproof and fireproof, and may carry stencilled wording or directions, or may be in part semi-transparent with wording in opaque ink. Each strip may be permanently secured to a spool by means of a wooden peg passed through a loop of the strip and housed in a groove formed in the core of the spool, and the film may be secured to the strips by being cemented between two layers of the strip, or by means of hooks or other disconnectible fastenings. The images may be in one or more colours, and sound records s may be provided along the margins. You can read the whole claim here. Google patents makes it easy to search for patents, and using this function I was able to download (for free) the US patent for Cecil Wray (of Bradford and Leeds), for his Coin freed photograph exhibiting apparatus (661, 299, 1900); and for Charles Urban’s Kinematographic Feed Mechanism (934, 242, 1909), amongst many others. A quick search for ‘kinematograph’ brought up pages of results, the oldest of which was a US patent for Auguste and Louis Lumière (634, 560) from 1898. It has been proposed to take, for such purposes, and exhibit, by kinematograph apparatus, photographs taken as three color records requiring three times the ordinary number of pictures for a given subject, but it has been found that the persistence of human vision is not such that the series of three successive color records, hitherto considered necessary for the exhibition of colors resembling the original, can be either taken, or exhibited, in the short space of time necessary to enable, on exhibition, the eye to retain, by persistence of vision, the impressions received from the three successive records so that the three color sensations appear to be received by the eye at the same time. I have found that persistence of vision is such, however, that only series of two color records, (the records of one color sensation alternating with those of the other color sensation), are necessary to present to the observer the appearance of the picture being in its natural colors, or approximately so, and I have found that the red and green color sensations are sufficient to give such appearance. As it is possible to take and exhibit series of two color records with sufficient rapidity to comply with the requirements of persistence 01 vision as regards color sensation, I can therefore pro vide means whereby so-called moving photographs, or bioscope pictures, can be taken, by photography, as color records, and exhibited in apparently their natural colors. Fascinating! Wrong – but fascinating nonetheless.